(Nanowerk Spotlight) Previous studies have revealed that single-walled carbon nanotubes (SWCNTs) strongly absorb light, especially in the near-infrared (NIR) region, and convert it into heat. There even has been a report that fluffy SWCNTs can burst into flames when exposed to a camera flash, which means the local temperature has reached 600-700°C. This effect has already been used to develop effective CNT-based cancer killers or extremely dark materials. In a new twist, researchers in China have now discovered that SWCNT buckypapers have a large Seebeck coefficient, indicating a strong capability to convert heat into electricity. Based on this, they have designed an opto-electronic power source which converts the incident light into electricity. 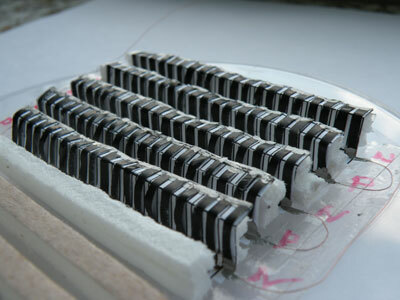 While this has been discussed as a theoretical mechanism, the team at Tsinghua University in Beijing has actually fabricated an integrated device that outputs a macroscopic voltage, moving forward towards practical applications. "We have proposed a potential approach to converting light – including sunlight – into electricity simply using single-walled carbon nanotube buckypapers" Changhong Liu, a professor in the Department of Physics and at Tsinghua-Foxconn Nanotechnology Research Center, tells Nanowerk. Liu explains that, compared with conventional semiconductor process, such buckypaper-based photoelectric conversion devices could be conveniently fabricated on a large scale and at low cost, and they also could be tailored at ease. Additionally, the excellent flexibility of the buckypapers favors the flexible fabrication of these devices, especially when specific structures are desired. Reporting their findings in the July 23, 2010 online issue of ACS Nano ("A Demo Opto-electronic Power Source Based on Single-Walled Carbon Nanotube Sheets"), Liu and his collaborators from the Foxconn Center describe the fabrication of this novel opto-electronic power source. The team fabricated as-prepared SWCNT sheets (p-type) and PEI-coated SWCNT sheets (n-type) from CVD-grown arrays of SWCNTs of around 2nm diameter and 0.36mm length. They then suspended small strips of the buckypapers, exposed them to NIR light with a wavelength of 980nm and recorded the output voltage. "The output shows a good linear relationship with NIR power density, indicating that SWCNT sheets are a good candidate for IR sensors, although the magnitude of the output is relatively small with a sensitivity of ∼ 12.6 µV/(mW/cm2)" says Liu. "We then proceeded to fabricate our power source by integrating a large number of these two types of SWCNT sheets in series which outputs a large voltage that sums over the output of every single element." He explains that the crucial step toward the integrated, large-output opto-electronic device is the fabrication of n-type SWCNT sheets with large negative thermoelectric coefficients. In the demo device, 50 p-type and 50 n-type elements were arranged alternatively and linked with each other in series. The sensitivity of the integrated device approaches is 100 times larger than a single p-type (or n-type) element. "Our demo power source successfully outputs a macroscopic voltage exceeding 0.1 V" says Liu. "It is reasonable to deduce that, by integrating more elements, a larger output can be obtained". The researchers also believe that by optimizing the sheet structure they can achieve a higher performance of the device. For instance, in order to improve the thermoelectric performance, it would be critical to eliminate the metallic tubes and/or incorporating other thermoelectric materials. Application areas for these buckypaper opto-electronic power sources could be in harvesting solar energy or as infrared detectors since the sensitivity can be amplified by integrating the elements. Liu cautions that one of the obstacles to the applications of carbon nanotubes-related materials in thermoelectric and photo-thermoelectric areas is the low figure of merit. "Therefore, in my opinion, effectively enhancing the figure of merit (especially the Seebeck coefficient) of carbon nanotubes-related materials is an important scientific problem to be solved".